Seafood Week celebrates the amazing fish and seafood on offer in the UK, encouraging people to eat more fish more often. Seafood Week is about giving seafood the recognition it deserves and thanking the people who produce it, from the fishermen who haul their fresh catch in all weathers to the chefs who serve it to our table. We have found some amazing recipes that combine fish and black pudding that we think you at enjoy, please try them and let us know what you think. A brilliant recipe from Fish the Dish. This dish is absolutely perfect for a family breakfast and really quick to prepare. For more great seafood recipes please check out their website. Mix together all the fish cake ingredients, season with salt and black pepper and shape into 4 fish cakes. Transfer to a plate, cover and chill in the fridge to firm up. Heat enough oil to just cover the base of a non-stick frying pan and fry the fish cakes on each side until cooked through and brown on the outside. Transfer onto a plate lined with kitchen paper and keep warm. In the same pan fry the black pudding until cooked through. Fry the tomato until lightly browned and fry the eggs according to how you like them. Place the tomato slices on 4 plates. Top each with the black pudding, then the fish cake and finish with the fried eggs. Serve garnished with parsley. Heat the milk in a large based pan and once boiling turn down to a simmer. Add the fish, cover the pan with a lid and cook for 6-8 minutes depending on the thickness of the fish, until the fish is cooked through. While the fish is poaching, heat the grill to medium. Grill the black pudding until it’s cooked through. Remove from the grill, keep warm and set aside. Heat the oil in a frying pan. Place the eggs in a shallow dish and add the bread, one slice at a time, to soak up the egg. Add the bread to the frying pan and cook, flipping over half way through until golden on both sides. Lay the eggy bread on 2 plates and top with the black pudding. 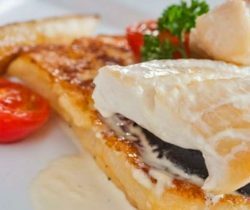 Remove the poached smoked haddock from the milk, drain and lay the fish on top of the black pudding. Serve garnished with the cherry tomatoes and parsley.